Over the past 17 years, Amy has installed eight solo-biennial exhibits. For each, she has chosen a Maine mill as her space. Her first exhibit was in the Bates Mill in Lewiston. That is where she’d like to have her ninth and final exhibit in September 2016. Amy is one of the most hard working and focused artists I know. Her work is elegant and conceptually innovative. Highly controlled and methodical, she embraces with a robust laugh the magic born of the accidental. She charts a course and sticks to it with a perseverance which is both personal and poetic in its own right. Wherever her final exhibit is, I will be there. In this Profile of a Maine Artist, Amy tells us a little about herself and where she finds inspiration. First, I chose one photo from one installation from each of her past eight biennials to give you a sense of the magnitude and the depth of her work. EXPERIENCE Succession III, plastic, water, India ink, audience. 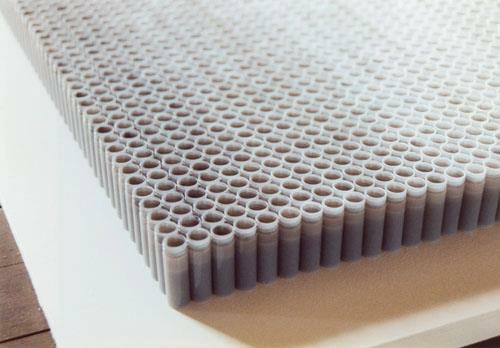 Water in each of seventy rows of seventy vials (4,900 total) precisely and gradually changed from black to clear, evaporating during the exhibit. 1. 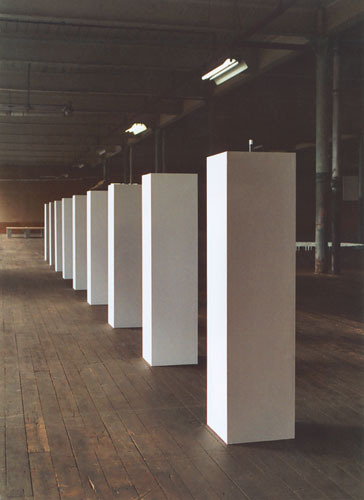 Amy’s first solo-biennial exhibit was EXPERIENCE, in the Bates Mill Complex in Lewiston, Maine, July 7- August 15, 2000. MOVEMENT Torsion, steel, galvanized aircraft cable, aluminum, hardware, wood, audience, Audience instructed to perpetuate rotational movement of three units. 2. 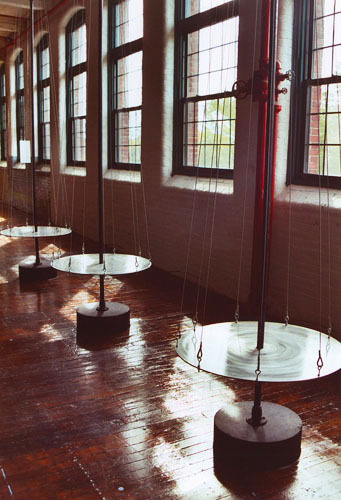 MOVEMENT was installed in the Old Sebago Shoe Mill in Westbrook, Maine, October 12-26, 2002. CHANGE Shift I, 9 pedestals, miscellaneous, audience. Invitation instructions: “Bring small personal possession with which you can part forever.” At the opening, Curtis placed upon each of nine pedestals a personal possession. The audience asked to choose object upon one pedestal, replace the object with object brought, and to take home object removed. Hundreds of objects were given and taken. 3. CHANGE was installed at Fort Andross in Brunswick, Maine, October 9-27, 2004. 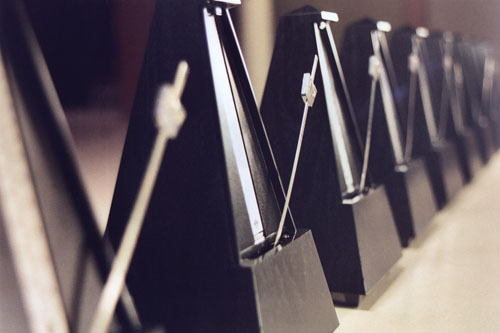 SOUND Pendulum III, 9 metronomes, pedestal, aluminum, audience. Curtis simultaneously restarted metronomes (all set at 144 beats per minute) every time they stopped using a tool she built. The audience listened as metronomes’ collective rhythm continuously changed. 4. SOUND was installed at Waterville, Maine’s Lockwood Mill, October 7-27, 2006. LIGHT Modulation I, 8,118 aluminum cans and 4-color prints, audience. Originally, from Curtis’ CHANGE, presented in larger scale, audience walked around installation as its perceived hue collectively changed from red to orange to yellow to green to blue to violet to red. 5. LIGHT was installed throughout the Sanford Mill, October 4-24, 2008. TIME Lux III, 99 hourglasses, pedestal, labels, audience. One hourglass for each hour of biennial on a 64-foot-long pedestal, Curtis inverted the first hourglass at 12 pm on October 9, 2010, marking the start of the exhibit. 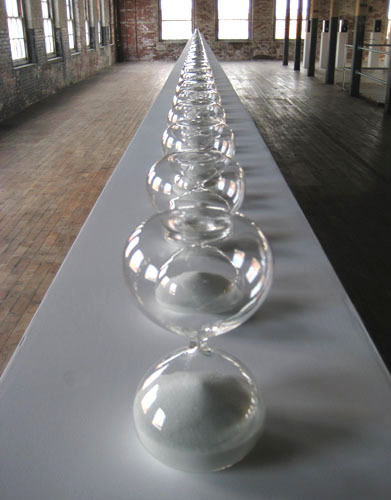 Subsequent hourglasses were inverted successively by Curtis and participants, one per exhibit hour. 6. TIME was installed throughout the Pepperell Mill in Biddeford, Maine October 9-28, 2010. SPACE Forward VI, 366 digital video clips, DVD projector/player, DVD-R, wood, drywall, rear-projection screen, audience. 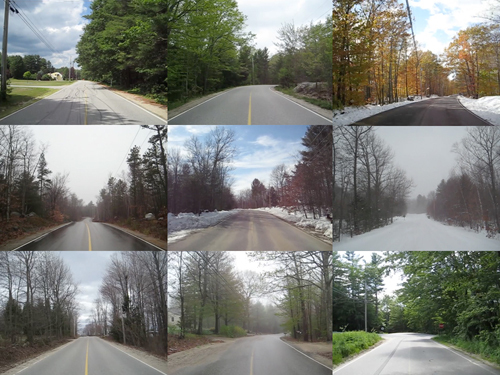 For a leap year, Curtis took video for every 24 hours, along entire length of road upon which she lives. She took first video 3 pm, June 21, 2011, second video 3 pm, June 22, 2011, third video 3 pm, June 23, 2011…last video 3 pm, June 20, 2012. Every 24 hours, Curtis stepped 65.1 feet forward (~4.51-mile length of road divided by 366). 7. SPACE was installed throughout three floors at Winthrop, Maine’s Winthrop Commerce Center (formerly Carleton Woolen Mill), October 6-26, 2012. MATTER Succession IV, 99 glass containers, water, 18 eye-dropper bottles, ink, ledger, ledger pedestal, pencil, audience, 10.4.14-10.24.14 Curtis set out to instruct each of 550 participants to add 9 drops of black ink to 99 cylindrical glass containers of water. 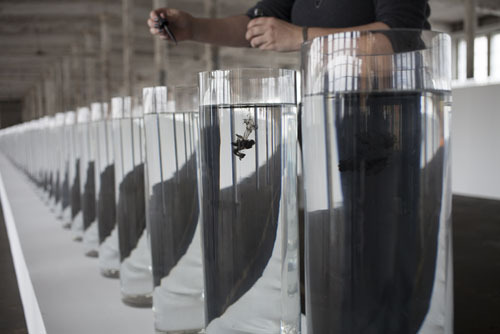 If all participants added ink as instructed, water from first container to 99th container would gradually darken from clear to black by precise amounts. Each participant initialed line of instruction in ledger, ledger indicating how many drops of ink to add to which container(s). Photo: Luc Demers. 8. 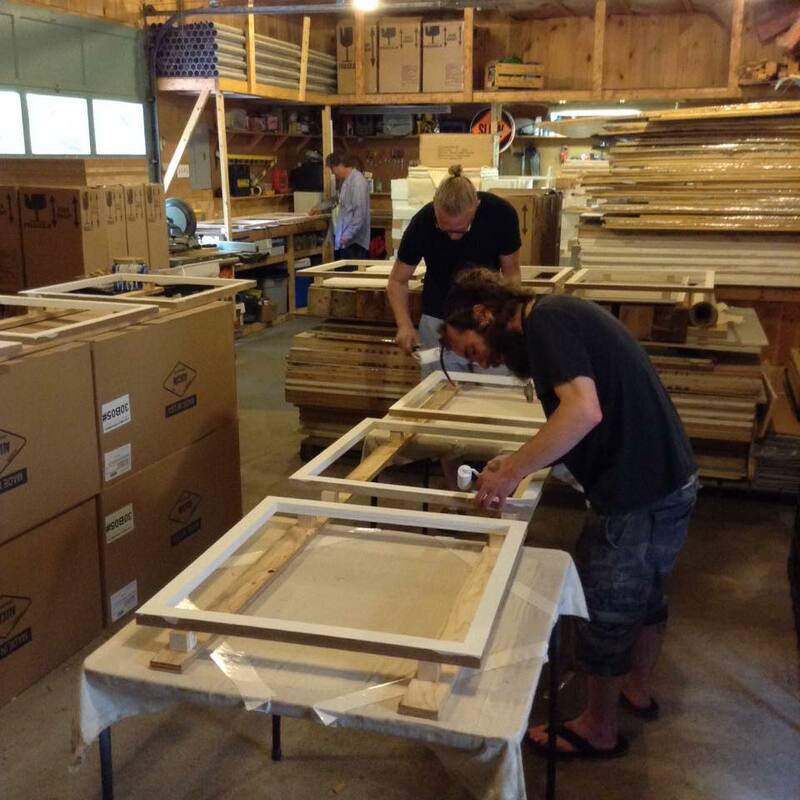 MATTER was installed throughout two floors of Parsonsfield, Maine’s Robinson Mill, October 4-24, 2014. High school: Haystack is My Hogwarts. 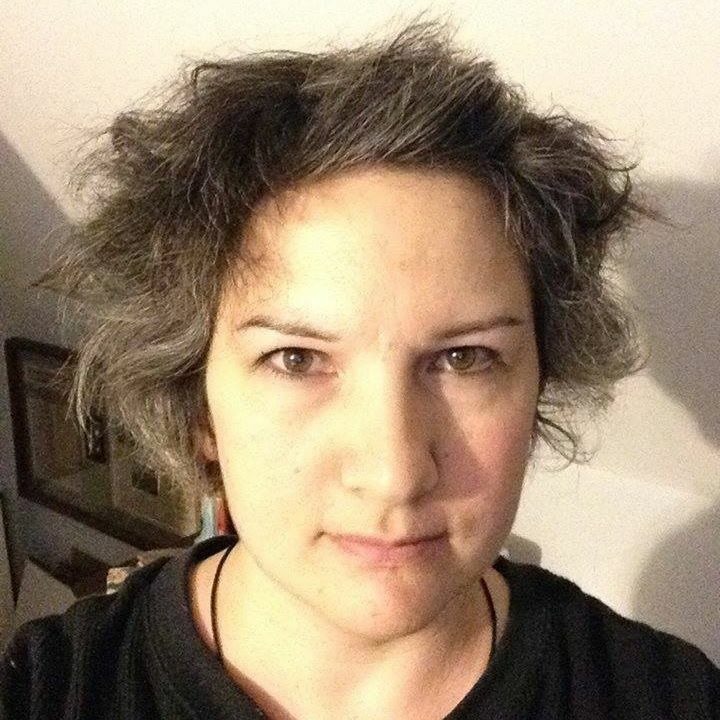 I received my BA in Studio Art and BA in Advertising from the University of Maine in 1993 and my MA in Art and Psychology from Vermont College in 2000. What is your preferred medium and why? Where do you find inspiration? I came to see the balance or sum of chaos, order, and repetition as a sort of equation for everything, an archetype for the interconnectedness of all. Through the imagery of my first solo biennial (see next question), I set out to intentionally explore the balance of chaos, order, and repetition, to begin to think about our part in the whole and how I could convey this to others. To convey how we affect everything and everything affects us, even when this impact is fleeting, I needed to make work which would enter audience’s physical, personal, and collective space, and vice versa, work which would impact audience and that audience would impact. Through temporary interactive installation, I could create a tactile metaphor about how we have effect on the whole and the whole has effect upon us even if this impact or influence is momentary. In 1998, I began an 18-year commitment to art-making, a project culminating through nine solo-biennial exhibits of interactive installation art from the year 2000 to 2016. In the end, I will have installed 81 large-in-scope, temporary works in the vast mills of eight or nine Maine towns. Each biennial exhibit is a 22-month process from conceptualization to documentation. Each exhibit explores a different theme while requiring audience to participate with its nine installations and revitalizing its historic site. After the biennial, my work exists only through documentation, dialogue, and memory. To see/read more about my process subscribe to [my blog] The Artist Plan. You can accomplish anything you want to from wherever you live if you are willing to work hard. Also, I teach professional development at the University of Maine. Readers can acquire my essays on my website. How can we find out where your 9th and final solo biennial will be and follow your progress? The only way to know my last location for sure is to write me to be added to my e-mail notification list amy@amystaceycurtis.com. How can we see work from previous biennials? To see and hear my eight previous biennials’ 72 works, visit my website or YouTube channel. 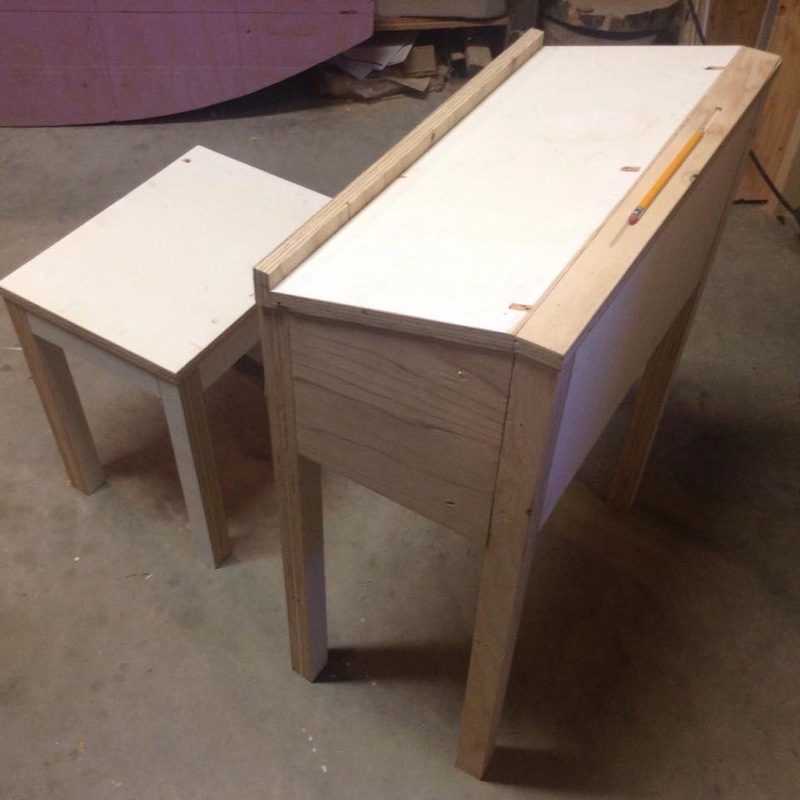 If you’re interested in helping Amy in her studio, contact her by email. You are more than welcome Amy. Your work is amazing. I hope to see you sooner rather than later!